Yet another exciting day as Dan Sindel's Symphonic Guitars earn a full page Pro-File in the media giant "Electronic Musician" magazines July 2008 issue. The article covers quite alot of ground as writer Emile Menasché eloquently summed up Dan's "Symphonic Guitar" approach to multi tracking layer upon layer of guitar tracks to create a huge wall of sound and also talks about his debut release of “Marching In: A Tribute to the March King John Philip Sousa”. 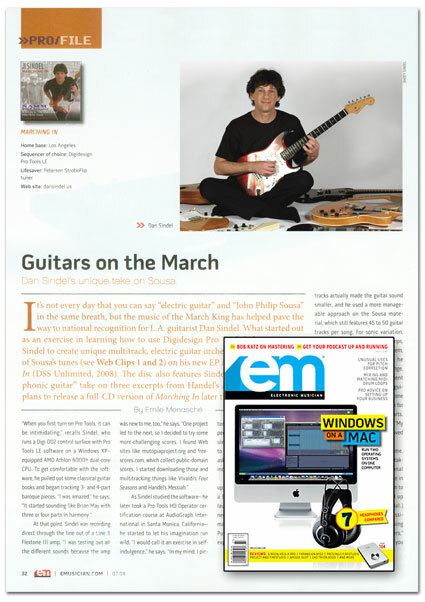 Dan states: "I have been reading Electronic Musician Magazine for a very long time and it is an absolute honor and a privilege to have been featured within EM's revered pages, it truly is a thrill and I certainly hope to inspire many a guitar player to try their hand at raising the bar regarding their methods of recording". It's not every day that you can say “electric guitar” and “John Philip Sousa” in the same breath, but the music of the March King has helped pave the way to national recognition for L.A. guitarist Dan Sindel. What started out as an exercise in learning how to use Digidesign Pro Tools led Sindel to create unique multitrack, electric guitar orchestrations of Sousa's tunes (see Web Clips 1 and 2) on his new EP Marching In (DSS Unlimited, 2008). The disc also features Sindel's “symphonic guitar” take on three excerpts from Handel's Messiah. The guitarist plans to release a full-CD version of Marching In later this year. Web Clips: Hear audio examples of Dan Sindel's music on Sousa.